Anyway… adult patients were eligible for enrollment if they reported pain greater than 6/10 and had a dose of intravenous opioid analgesia (about 5mg morphine I think… but half got hydromorphone). Patients were randomized to 0.1mg/kg of ketamine vs. placebo. At 30 minute intervals they were asked their pain level and if they needed more pain medication. Without going into too many details, the authors claim that ketamine as an adjunct to opioid therapy was more effective at reducing pain. 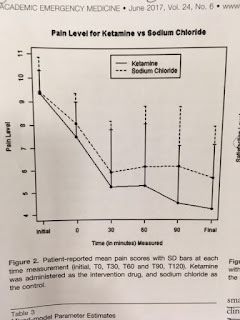 If you look at the pain reduction over time, it looks like the ketamine worked best at 120 minutes; long after it should have worn off. I’m sure someone could come up with some biological plausibility for this, but it does seem odd. 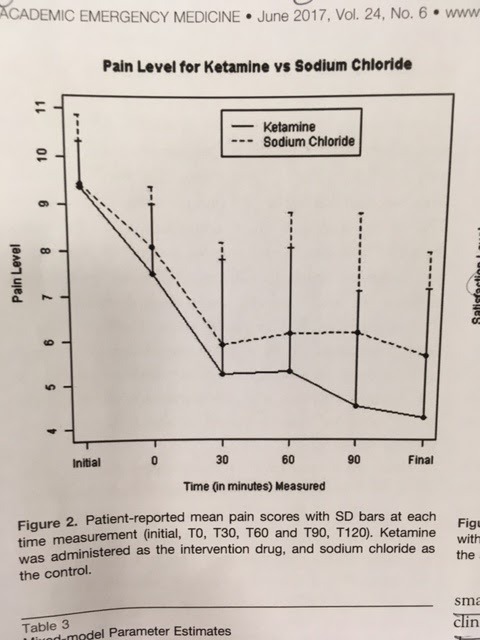 50% of the ketamine group had patient reported side effect. But “no patient had side effects lasting longer than 6 minutes.” I find this very difficult to believe. So in the end, a study claiming a low dose of ketamine 0.1mg/kg had quite an analgesic effect. This is of course discounting the low total dose of opioids given, changing research methods, numerous figures & tables that were wrong and some dispensing of belief. Opioids have been around for a long time. They are reasonably safe, predictable & effective with a reversal agent. Researchers have been furiously looking how we can “spare opioids.” How about more research on how we can "spare ketamine!" Ok... perhaps I've overstated things. There probably is a role for low dose ketamine when adequate doses of first line analgesia are contraindicated or not working. But unfortunately this paper does not really add much to our knowledge. Bowers JK, McAllister KB, Ray M, et al. Ketamine as an Adjunct to Opioids for Acute Pain in the Emergency Department: A Randomized Controlled Trial. Acad Emerg Med 2017;24:676-85.